It’s been a little while since I’ve reviewed something but I do like to actually put some decent mileage into a product before I can decide on how it performs. Today it’s the turn of the Berghaus Vapour tech tops. As a budget minded runner, I often need to search for new kit based first on a price range (I still buy the very best I can afford though) technical shirts tend to be one of those areas where you can often skimp a little and get by your whole running life wearing shirts you got at races which I find is usually perfectly reasonable for jogging to work or doing a shorter run sometime but when it comes to longer runs it’s a good idea to invest in something higher quality. It’s fair to say that since joining the Trail Team out in Chamonix back in July and at the Berghaus Trail Chase recently I’ve put a lot of sweaty miles in running around the Alps, the North York Moors and all around my local area trying to get into decent shape for the three main races of the year I’ve had in my diary and a lot of that time has been spent mixing between wearing the Berghaus Vapour Singlets and Long Sleeve tech tops and they really have made a difference to my comfort while running this summer. It’s fairly safe to review both the singlets and long sleeved tops as one really because they both share the same sort of construction, both use (to quote the Berghaus site) “ARGENTIUM® fabric powered by Polygiene®” and both have UPF30 sun protection built into the fabric and so the only significant difference is obviously the long sleeves and zip are not on the singlets. Despite the temperatures I’ve actually worn the long sleeve quite a bit this summer, it’s designed to be a lightweight base layer primarily and it does a great job, when it’s hot, I roll up the sleeves. Back to the cheap tech tee’s for a minute, one of the main problems ends up being the funky smell that no matter how well you wash stuff seems to just be there – especially when you warm up after you start running – and you find yourself trying to outsprint your own stink or not bothering to stop at that shop to buy a drink because you’ll reek the place out. Higher quality technical tops these days all boast some sort of honk resistant technology and for the most part this is what makes them worth the price. Whether it’s ARGENTIUM® or something else it’s good to have actually put this to the test both in Chamonix where we spent two days running sections of the CCC course with an overnight stop and I ran a full day in the long sleeve, hung it up to dry (it dried quickly) and then wore it again the next day without and pong. Something I did again over the two days at the Trail Chase so the no smell promise on the product description is most certainly accurate. These tops are actually also very comfortable when wet, either in driving rain or drenched in sweat (how delightful ..) as they’re reasonably close fitting they don’t rub like cheaper tops can do. Wicking sweat away is ok but I find in any top once it’s soaked it tends to stay wet but without a shadow of a doubt these cling on to less moisture than some of the cheaper tops I’ve worn in the past and when hung up they certainly dry quicker which would no doubt be of use to those in multi-day events. Good stuff, the singlets are £25 and the long sleeve is £40 which is similar to many similar tops and now I’ve had a chance to extensively use both types of top, I’d be happy to buy more and start phasing binning some of my slightly whiffier gear from the back of the running kit drawer. I have noticed a small amount of bobbling of the fabric where my backpack waist strap seems to have rubbed but I run with a pack 5-6 times a week (run commuting) and this wear and tear has happened to every top and jacket I’ve owned so I don’t think it’s anything to do with these shirts but if the Berghaus product boffins could find a solution to that particular problem that would be great! 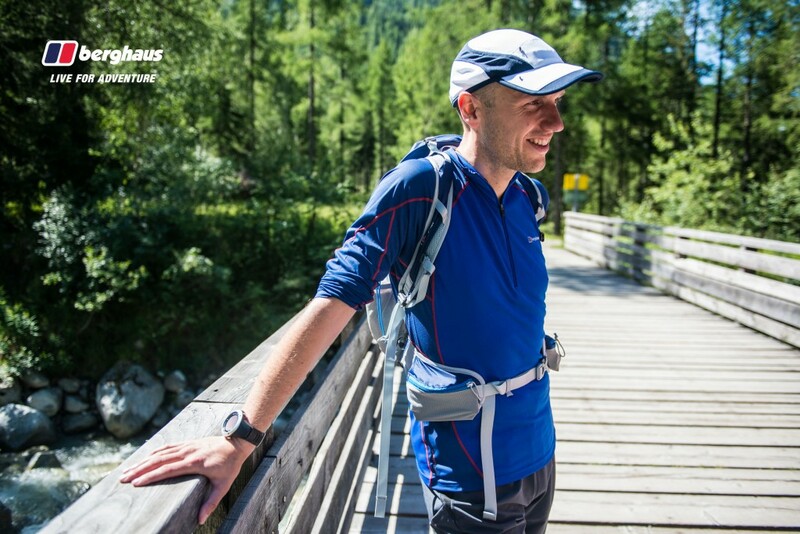 Note/Disclaimer: My review tops were provided free as I am lucky enough to run on the Berghaus Trail Team but I feel more than comfortable recommending these.